Examples, solutions, videos, activities, and worksheets that are suitable for students studying fractions, decimals and percents. 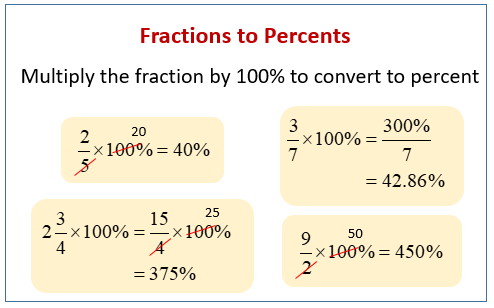 The following diagram shows examples of converting fractions to percents. Scroll down the page for more examples and solutions of converting from fractions to percents. If the fraction is a mixed number, convert it to improper fraction first and then multiply by 100% to get a percent. Some examples converting fractions into decimals and percents.